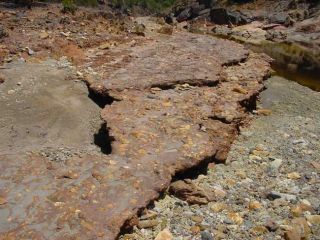 A cap of iron-rich rock preserves microbes that lived in Rio Tinto about 2 million years ago. Scientistsworking on the MARTE (Mars Astrobiology Research and Technology Experiment)project have been drilling into the ground around Rio Tinto in Spain. They were studying underground environments and discovered areas that wereinhospitable to life. Inhospitable,that is, until they were colonized by toughmicrobes. Theseorganisms improved conditions so much that other creatures could move in. Thishas important implications when looking for life on other planets. Theteam,led by David Fern?ndez-Remolar of the Centro de Astrobiolog?a in Spain, expected the underground areas to be barren. They were understandably surprised tofind places perfect for microscopic life. What was going on? The answer came inthe formof tiny microbes that reacted with the rocks and then gave off heat. Itwasn't much — just enough to raise the overall temperature and make theenvironment more liveable. Sojust by colonizing an area under the ground, the microbes made it habitable forother forms of life. They're like construction workers, building comfortable homesfor others. Of course, the microbes weren't trying to make conditions better —it's just a happy side-effect of their natural processes. Theresearchers also found that the acidic conditions they were expecting had beenneutralized by metals, making the water safe for life. The microbes aren'tinvolved in this process, although they do benefit from it. Sucha two-tiered system could make areas on other planets relatively cosy forsimple life. It can even help us find evidence for past or present life onMars: We could look for slight temperature increases near the surface, or thechemicals that reduce water acidity. Such tell-tale signs would indicate thatthe same mechanisms working in RioTinto could be happening on Mars. Usingthese discoveries, we can imagine how lifeon Mars could have developed. Conditions on the red planet in the past werevery different from today. There was probably warm water underground, whichwould have helped make certain metallic ores. These are important as they couldhave been used as food for the "construction worker" microbes. Asthey grew and reacted with the rocks around them, the microbes would havegenerated heat, making their environment warmer. It would have still beenbitterly cold, but salts would have kept the water liquid, even if thetemperature dipped below the freezing point. This shallow water could haveprotected the microbes and any other life from the sun's normally lethal ultravioletradiation. Metalsin the rocks would have made sure that the water wasn't too acidic. Over timeother organisms could have colonized the area after the first microbes had madeconditions much nicer for life. ?The result would have been simple Martian rockpools teeming with strange microbial life. Looking into one such poolwith a microscope would be a dream come true for astrobiologists. "It may be possible that the inner habitats of planetswere not only the first refuge of life, but may also have become the last forplanets such as Mars," the researchers report. Onceour technology for studying planets around other stars improves, we couldsearch for signs of life like this around distant worlds. They may not be asglamorous as aliens we could talk to, but these hard-working microbes may wellprovide the foundations for areas filled with exotic life. The research is detailed in the spring issue of the journal Astrobiology.